The general capital of the richest pople in Ukraine dropped by a quarter, to $ 20 billion in 2016, Forbes Ukraine. Rinat Akhmetov has topped the list with $2300 million engaged in metallurgy, fuel and energy complex. Owner of one of the largest banks in Ukraine Ihor Kolomoisky secured $1300 million and got the second spot. Gennady Bogolyubov has the capital of $1300 million raised in the sectors of finance, metallurgy, fuel and energy complex. Viktor Pinchuk took the fourth place with a fortune of $1200 and business in metallurgy. Yuri Kosyuk's capital totaled $1000 million. 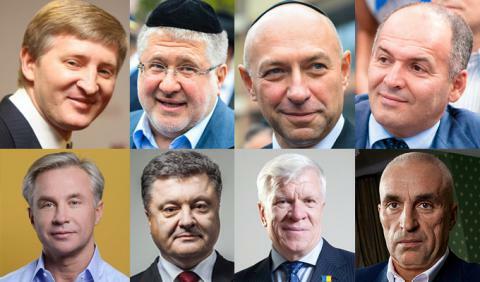 Ukrainian President Petro Poroshenko took the sixth spot with a capital of $858 million due to his businesses in food industry, media, and agro-industrial complex. The full list in Ukrainian presented on the official Forbes website.